Trigger Warning explores the masks we all wear and the people we are beneath them to reveal our vulnerabilities and our truest selves. Here is a rich cornucopia of horror and ghosts stories, science fiction and fairy tales, fabulism and poetry that explore the realm of experience and emotion. 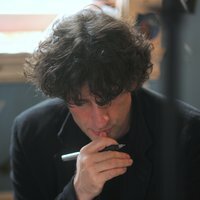 In "Adventure Story"--a thematic companion to The Ocean at the End of the Lane--Gaiman ponders death and the way people take their stories with them when they die. His social media experience "A Calendar of Tales" are short takes inspired by replies to fan tweets about the months of the year--stories of pirates and the March winds, an igloo made of books, and a Mother's Day card that portends disturbances in the universe. Gaiman offers his own ingenious spin on Sherlock Holmes in his award-nominated mystery tale "The Case of Death and Honey". And "Click-Clack the Rattlebag" explains the creaks and clatter we hear when we're all alone in the darkness. I didn't love this collection. I didn't, and I'm so ashamed. Neil Gaiman is my whole, whole literary-loving heart, and the fact that I didn't love his last major publication either (The Ocean at the End of the Lane - Review), has this heart breaking. I won't be reviewing each story on it's own, because, to be honest, I tended to skip the ones I wasn't enjoying. 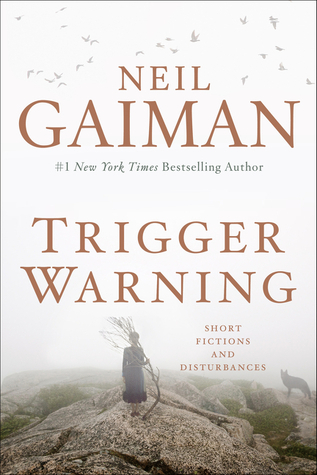 Trigger Warning began with the most fantastic intro, and the anticipation of such wonderful things to come. I was promised disturbing tales, and cautioned to read at my own risk. What I went on to read were interesting stories, at best, but definitely not anything that gave me serious shivers, or pangs of an uncomfortable nature. My favourites were: Lunar Labyrinth, The Thing About Cassandra, The Truth is a Cave in the Black Mountains, A Calendar of Tales, and Click-Clack the Rattlebug. For me, those were the types of storylines that I had anticipated: odd, quirky, creepy, and memorable. The others, I could have done without-they were drawn out, and way too convoluted for my taste. The silver lining of this collection, however, is that if you go into it thinking you're only getting the typical Gaiman-esque wonder and fantastical notions, you're going to be pleasantly surprised at the other genres he tries his hand at. There is homage paid to the likes of a one Mr. Sherlock Holmes, as well as everyone's favourite Doctor. Sadly, I am a forever fan of Mr. Gaiman's fantasy/paranormal work, so this one just didn't work for me as a whole. Recommended for Fans of: Fantasy, Paranormal, Horror, Science Fiction, Mystery, Suspense, Terry Prachett, Douglas Adams, Doctor Who, Sherlock Holmes.